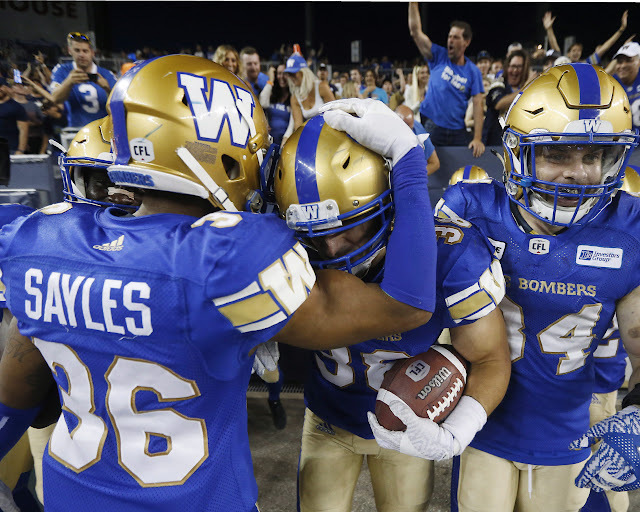 WINNIPEG - Nic Demski ran in one touchdown and caught a pass for another as the Winnipeg Blue Bombers beat the Toronto Argonauts for the second week in a row, coming away with a 40-14 victory on Friday. Demski, a Winnipeg native who signed as a free agent after three seasons with Saskatchewan, finished with three carries for 34 yards, including his 28-yard TD run. He also had five catches for 82 yards with a 42-yard TD reception. Winnipeg's other hometown running back, Andrew Harris, rushed 10 times for 28 yards and caught five passes for 50 yards. In last week's 38-20 victory over Toronto, Harris torched the Argonauts for a career-high 161 yards rushing with one TD on the ground and a second off a pass. Justin Medlock booted four field goals for the Bombers. The victory boosted Winnipeg's record to 4-3 as the team heads into its first bye week of the season. Toronto, which had seven turnovers, fell to 1-5. The last time the Argos got off to a 1-5 start was in 2011, when they opened that season 1-6. Argonauts starting running back James Wilder Jr., who left Toronto's practice Wednesday with a leg injury, had 15 carries for 81 yards and one TD. He also hauled in four catches for 51 yards. Drew Wolitarsky had an eight-yard TD reception for Winnipeg and linebacker Ian Wild ran 18 yards into the end zone after Toronto kicker Ronnie Pfeffer had a punt blocked by Winnipeg fullback Mike Miller. Medlock made all his converts and booted field goals from 47, 20, 45 and 22 yards. Wilder Jr., pushed in for a three-yard TD. Quarterback James Franklin scored on a one-yard sneak, but was sacked on the two-point convert attempt. Pfeffer made one convert. He got up slowly after Moore ran into him. The Bombers also conceded a punt single. Winnipeg quarterback Matt Nichols completed 19-of-28 pass attempts for 253 yards with two TDs and one interception. Franklin was 20 for 31 for 236 yards with zero TDs and three interceptions. The Bombers led 13-0 after the first quarter, 23-8 at halftime and 26-8 after three quarters. Medlick booted a 47-yard field goal 1:33 into the game. The score was set up by receiver Daniel Petermann's 55-yard kickoff return, which began with a pitch from defensive back Tyneil Cooper. Toronto appeared to be on the move after Demski's TD at 6:26, but a turnover killed its momentum. Franklin completed a long bomb to receiver Rodney Smith, but he fumbled the ball while being tackled by Brandon Alexander. Winnipeg defensive back Kevin Fogg picked it up. A 51-yard reception by new Bomber Kenbrell Thompkins helped set up Medlock's 20-yarder at 12:11. After Wilder plowed across the goal line at 6:33 of the second quarter, Nichols was intercepted by former Bomber T.J. Heath. The Argos only came away with a point after the Bombers conceded a punt single. Toronto unsuccessfully challenged a pass interference call, leading to Demski taking a handoff and scampering close to the sidelines on the way to his second TD at 12:31. The half ended with Fogg picking off Franklin, a turnover Winnipeg used for a 45-yard Medlock field goal with 58 seconds remaining. Toronto got to Winnipeg's 11-yard line in the third quarter, but Franklin was stopped inches short on a third down with a yard to go. The turnover on downs only led to a Winnipeg punt. Alexander stepped in front of Armanti Edwards in the end zone and picked off a Franklin pass. This time, the Bombers used the turnover for Medlock's 22-yarder as time expired in the third quarter. Wolitarsky ran in his TD at 5:19 of the fourth. Wild's TD after the blocked punt came two minutes later. Franklin's QB sneak was at 12:06.